How to Build a SunflowerHouse With Kids — The ULTIMATE Kids' Garden! Looking to plant the ULTIMATE kids’ garden with your children? Get step-by-step instructions for this easy 1-2-3 sunflower house idea below, as well as ten more playful kids’ garden ideas! Want to make your backyard awesome? I double dog dare you to read this post and not add this sunflower house idea to your summer to-do list. 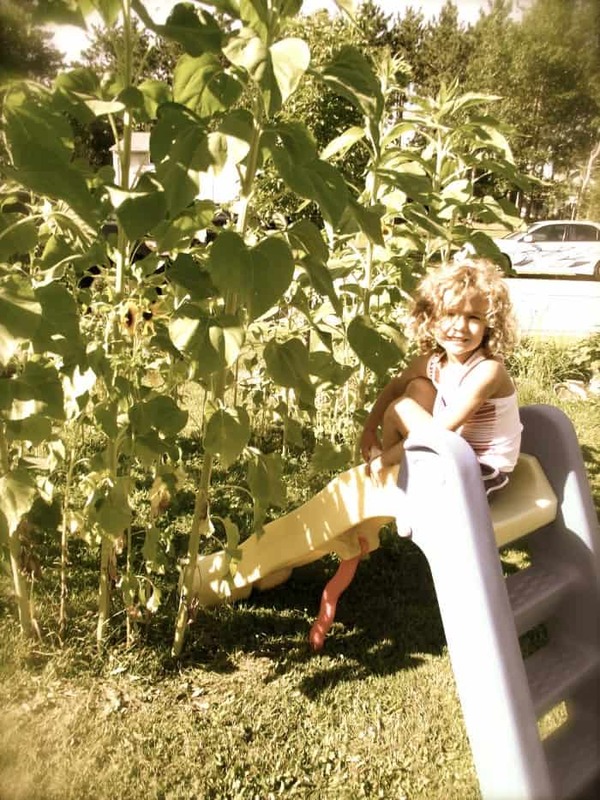 By building a sunflower house, you’re creating a children’s garden that is also a magical living fort. 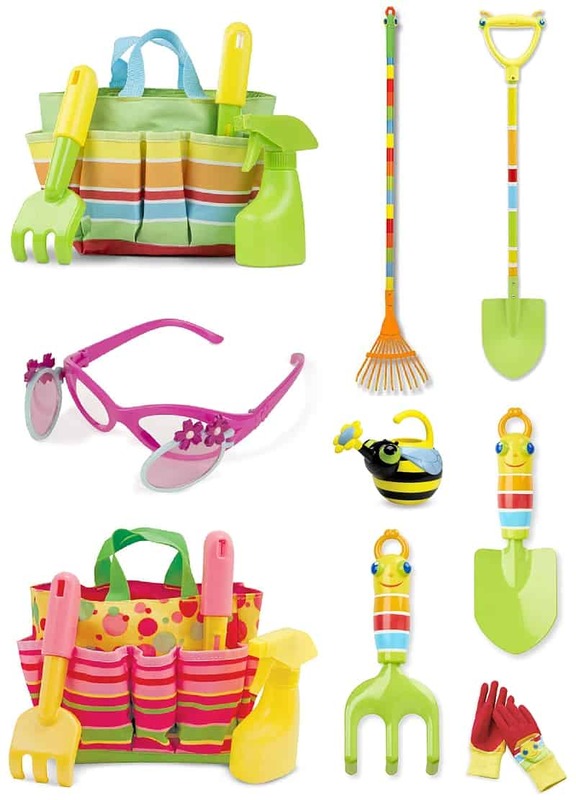 In other words, your kids’ garden becomes a DIY playhouse that they engage with throughout the summer. Suddenly, your children’s garden becomes a secret hideaway, a clubhouse for sibling meetings, an outdoor fort to share with neighbors, and a private reading nook. 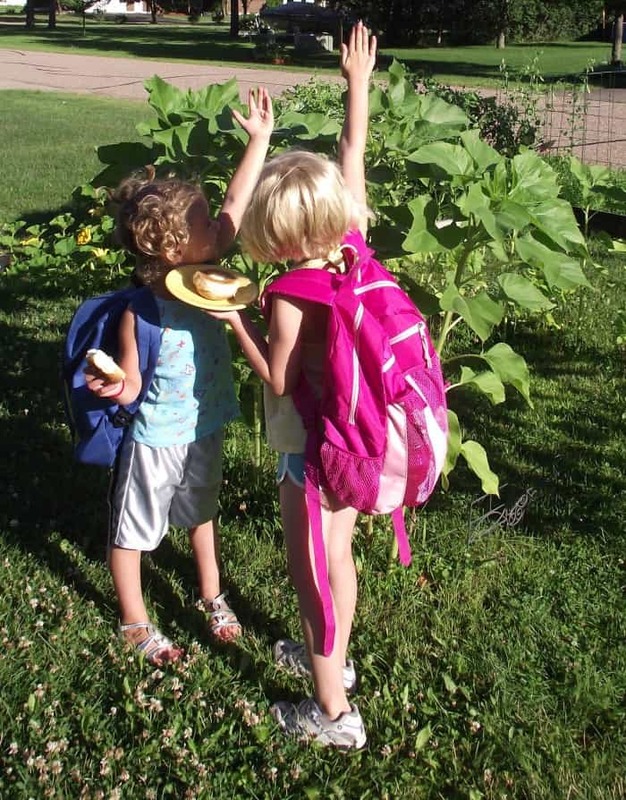 With this kids’ garden, you’ll foster not only creativity but also a love of science. The sunflowers will hold their attention throughout summer as they grow past their knees, produce leaves the size of their hands, and eventually gigantic blooms that tower over the heads of the adults in their lives. They’ll notice butterfly and bumble bees as the sunflower bloom in the summer and birds picking out the seeds in the fall. But this living kids’ fort goes even beyond even creativity and science; it is also a gratitude garden. 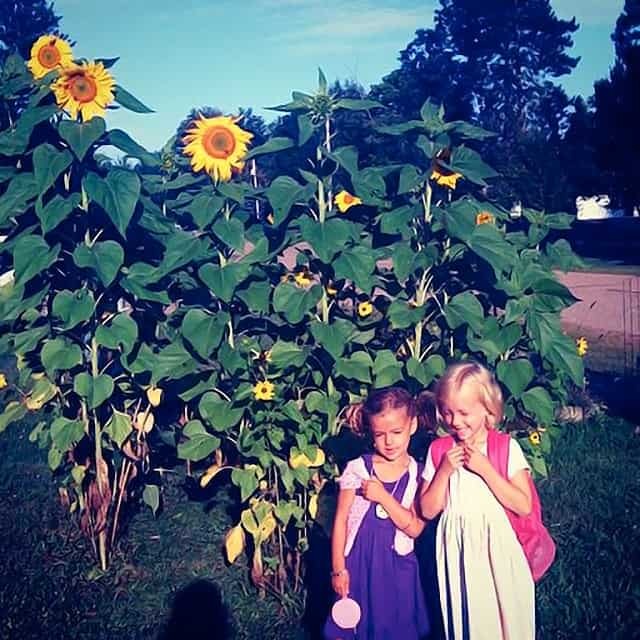 Your children will pause and notice the beauty in the diversity of the sunflowers. Plus, mid-summer the smaller sunflowers are perfect for creating bouquets, giving you the opportunity to write a kind note (or draw a picture!) and gift a friend some sunshine. Are you ready to get started on your family’s sunflower house? 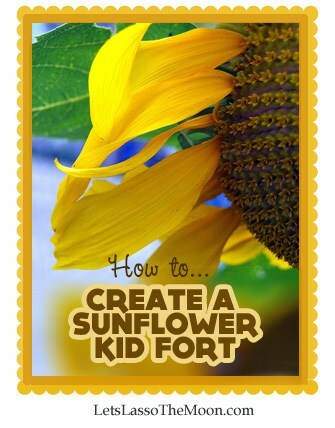 How to Grow The Ultimate Kids’ Garden — Build a Sunflower House! The directions for this sunflower house are as easy as 1-2-3. 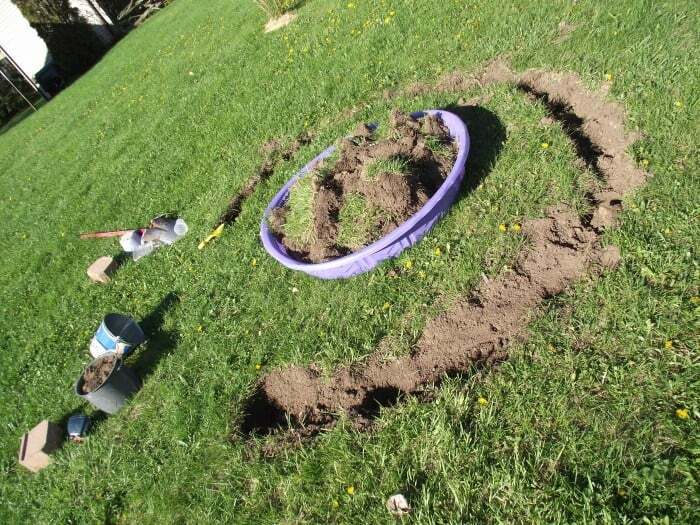 1 — Pick a spot for your outdoor fort and dig the outline for your kids’ garden (AKA: sunflower house). To get started on this DIY fort, you’ll want to look for a kid-friendly place in your yard which gets a lot of sunshine. We are planting sunflowers after all! Be sure to leave a small gap for an easy-to-access entrance to the sunflower house. 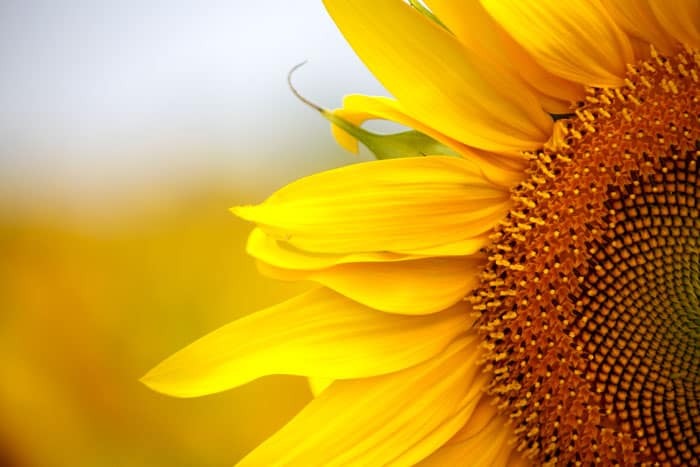 2 — Build privacy into your kids’ sunflower house by using a wide variety of flower seeds. Mammoth sunflowers are a MUST when creating this DIY playhouse —Yes, an absolute must! While the giant sunflowers are fantastic, it is important to plant smaller sunflowers as well. The variety in size helps to create a sense of privacy within the outdoor playhouse. This post contains affiliate links. If you purchase something through the link we may receive a small commission at no extra charge to you. You’ll want to get a variety of sunflower seeds ranging in size and colors. If you don’t want to purchase four different packs of seeds for your sunflower house, consider splurging on the giant or mammoth and getting a mixed variety sunflower pack at your local garden store. Variety packs work great too! That all being said, we did strategically place the giant and mammoth sunflowers to ensure they had room to thrive, but we opted for every 12 inches (rotating between the two) instead of the recommended 24 inches. This planting strategy helps ensure the kids’ garden house offers a sense of privacy. You can plant your kids’ garden any time after your region is frost-free. Most of the smaller sunflower seeds take about two weeks to germinate, while the larger giant and mammoth seeds can take up to twenty-one days. So we’ve generally planted late May for early June plants. Encourage your kids to take on the responsibility of watering the outdoor playhouse if there isn’t enough rain and the soil is dry. 3 — Watch the sunflower house GROW, GROW, GROW. Once you build this awesome kids’ fort, you get to watch it grow all summer (and enjoy the variety of birds who feast on the seeds in the fall!). Creating a kids’ garden is a wonderful reason to slow down in the morning before heading off to summer school to check on growth. We encourage you to pause each morning to check the height of the sunflower house, take a photo, or just dance around in the awesomeness of it all for a minute. A quick safety note: I do not recommend growing a sunflower fort for your children if anyone in your family has an allergy to bees. We played in our fort all summer without any stings or issues. The bees seemed to favor the taller sunflowers, so it wasn’t an issue for our family. Please use common sense when planning summer activities for your kids! The girls immediately took to their private space by adding a gate even before the flowers came in. They would read in the fort, play dolls or sometimes just chit chat. Despite the plants being only a foot tall, they seemed to feel as if they were separate from the rest of the world. The girls eventually dragged their slide over to the entrance to make the sunflwoer house a “kids only” zone. 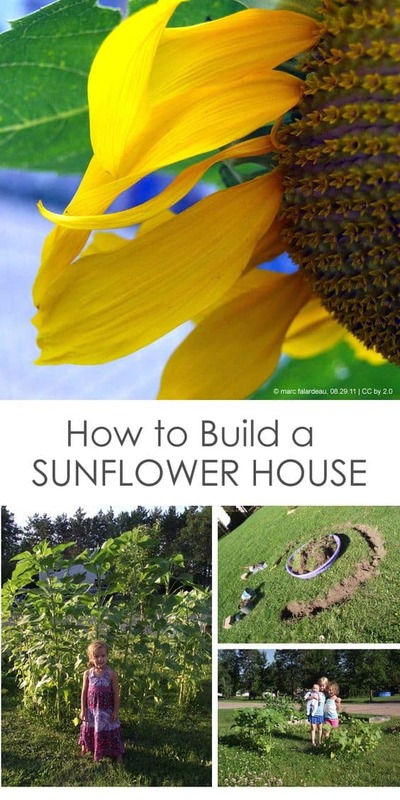 You and the kids will have a wonderful time growing a sunflower house. Smiles guaranteed. Watch the video of our sunflower adventure here. I know it is long, but sometimes as a mom, I just cannot edit out the excess; each photo, each twirl, each phase is precious to me. I know you understand! SIDE NOTE: Did you like the cello music in the video? I instantly fell in love with Zoe Keating while listening to an interview on the podcast Radiolab. This song is the music of one cello that is looped and layered. Keep your curiosity alive by subscribing to the podcast Radiolab. You won’t regret it. Once you subscribe, let me know which specific episodes floor you! If you do a sunflower house or one of the kids’ garden ideas above, be sure to tag us on Instagram (@letslassothemoon) so we can see you kids’ garden! Our world’s honey bee population continues to decline. This summer, use your garden space to not only connect with your kids, but to help grow a beautiful (and pesticide-free) environment for your local bees. 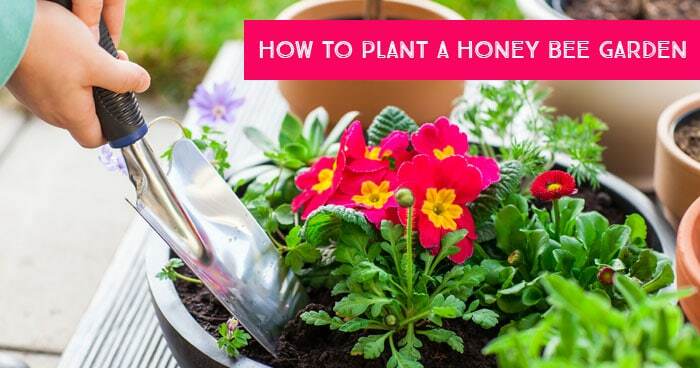 Get tips on how to plant a honey bee garden with kids here! Photo Credit: Thank you to Marc Falardeau for making the beautiful sunflower at the start of the post a creative commons photo! Beautiful! This project turned out so amazing. Your girls are so sweet with the sunflowers towering over them. I wonder if we could get away with growing something like this in our sterile corner of suburbia. Your video makes me want to try. Last summer we grew sunflowers in one of our raised gardens vs. the house format. It was equally as fun. There are so many different varieties you can plant. We had fun cutting them down and giving HUMONGOUS bouquets to neighbors, teachers, friends, etc. If you don’t have room for a full sunflower house I would recommend planting some near the side of your house where there is sun. 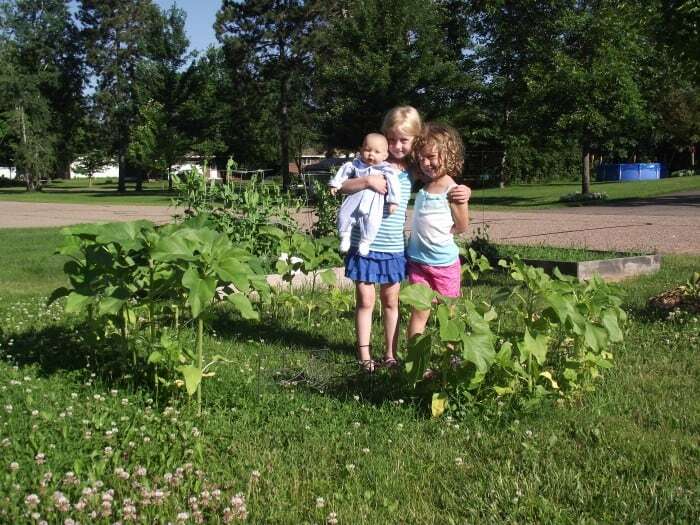 You will notice in the last photo here a few “smaller” sunflowers that are still as tall as the girls. Still the giant sunflowers are the best to watch grow! I just found your blog, and since I’m also new to Montessori – I’m excited to see what you post next! Mari, thank you for the nice compliments. I love how bloggers work together to spread interesting ideas. It is so empowering! Our family “fell into” Montessori on accident, but it has changed our lives. My mindset is different now with the way we run our house, the way we interact with our girls, the activities we chose to participate in… I am excited to continue to read your blog and see how your ideas can work with our family too! beautiful! and thanks for the radio lab link! This is such a great idea – I’m having a growing green-fingered kids series on my blog and would love to link to this post in my one next week about planting sunflower seeds as something to do with them. I’ve also pinned to my gardening with kids board on pinterest and can’t wait till we have our garden sorted to try it out. I feel just a slight pang that they have their backpacks on in the beginning and then again in the last scene. A season gone by. I don’t care how cliche’ it is; They really do grow up fast. Sara, yes! A whole season from spring to fall. Oh thank you for pointing that out. Your comment made my heart smile and I don’t care how cliche that sounds either. WOW! I love this idea! How magical! I hope we can find a way to fit one of this in our small space. I remember creating forts in the woods when I was a kid. I love the idea of creating one out of sunflowers! We love building forts in the woods too. Although this summer one of my ladies got a deer tick in her hair and that freaked me out. Still, I let them Sally forth! What’s cuter? that the little blonde looks almost exactly like my own Megan, or that she is wearing the cutest 80’s shorts in one shot! Love the sunflower house, and will be planting our own this weekend! I know summer to-do lists can get pushed aside. If you followed through I’d love to see images you have to share! Thanks Donna. I love Zoe Keating’s music too. Just lovely. I have one BIG problem, no real sunny areas in my fenced yars. adn I live in a trailer park. You don’t let am 19 to 24 month old play outside the fence. I sure wish I could do this.tho. I would love to do this, as my daughter is always planting sunflowers in pots on the deck. But, if we did it in the yard I’m afraid the squirrels/bunnies would get them- any ideas on how to keep the critters away from the sunflowers?? I love your idea and your video! I am going to do this for my two granddaughters this spring! I have the perfect place for it too, where an old maple tree was removed in my backyard. Woohoo! Fun times ahead! Thanks for sharing! I’d love if you shared photos with me on Facebook Robyn! How funny, I was just telling my husband the other day that we needed to make a sunflower tepee of some sort! I even picked up some seeds. Now for the rain to stop! Beautiful! The music just melts my heart and your girls too. How amazing, feeling inspired to make a sunflower circle. Phil, we did have some bees. I definitely don’t recommend this project if your child has allergies! However, for us, the bees came really late in summer … when the sunflowers were very tall (5 feet). They sort of hovered up there in their world and the kids played below without incident. I suppose it might depend where you live as well. How do you cut the grass inside it?? Awesome idea! Just wish we has the room i our garden to create one as we love sunflowers! Oh, I’m in love! Thank you for sharing such a magical idea. I love this idea! We bought three types of sunflower seeds and I can’t wait to see what happens. It’s like creating magic in my own backyard! Kids will love this a lot! I found your weblog web site on google and verify a few of your early posts. Proceed to maintain up the superb operate. I just additional up your RSS feed to my MSN Information Reader. Seeking ahead to studying extra from you later on! ?